Without asserting any opinion about whether or not sales tax should be suspended for gasoline, I thought it might be helpful to let everyone know how much they would save if it were. The following are my calculations of the savings PER MONTH given the type of car you drive, the price of gas, and your average commute. (In the examples, "downtown" refers to downtown Indy). Gas prices are currently about $3/gallon in Indianapolis, so that row is highlighted in yellow. You will have to click on the picture to read it. Unless you are Superman or have a powerful magnifying glass handy. 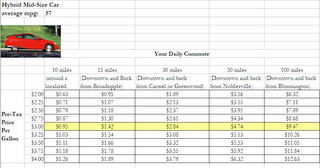 A person with a mid-size car that drives 15 miles per day will save $3.86 per month. Don't spend it all in one place! It's really not even as much as you calculated. You've assumed that people make their daily commute every day (30 days a month), when in reality people tend to work about 20-22 days a month. (And tend to drive a lot less on the weekends). So use the larger figure (22 days)or maybe, better yet 24 days to capture all that weekend driving and you'll probably have a pretty close approximation. 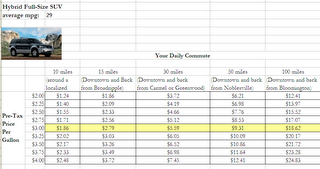 In your example, the number would be $3.09 per month in savings for a mid-sized car, Broad Ripple-commuting person. The government, after all, is much better equipped to spend my money well than I am. Heck, I'd probably just spend my extra $3.09 on a pack of cigarettes. A sales tax is better than a Income tax hike. In Morgan County The Income tax has set a record by doubling. 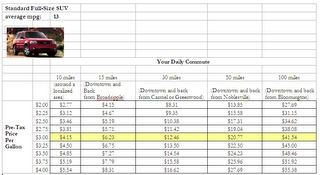 At least with a sales tax people who have more pay more and those who have less pay less.